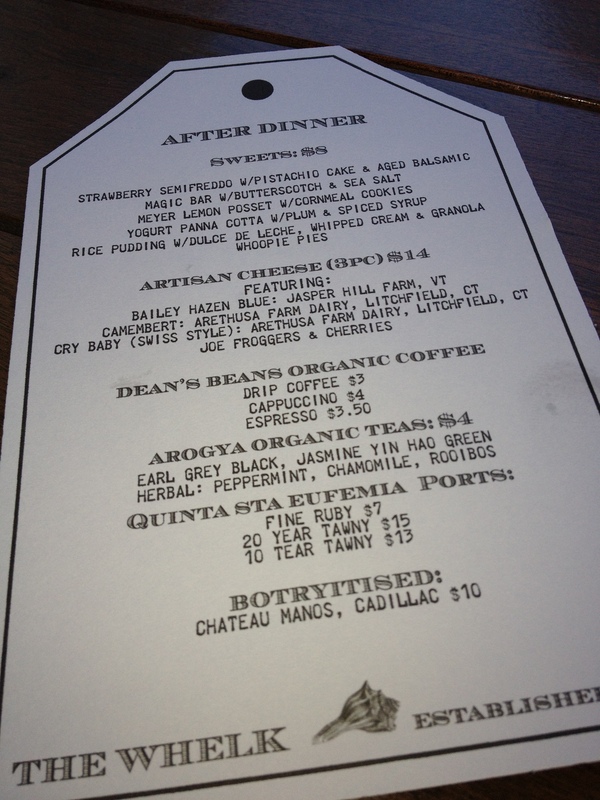 Last year at about this time, we visited Le Farm restaurant in Westport, CT. The restaurant’s owner and head chef, Bill Taibe, is one of the leaders in the area for the farm to table movement, where fresh food is bought from local farmers, brought into his restaurant and served to his customers. In January of this year, Bill Taibe opened up his latest restaurant, The Whelk, along the water in Westport. This new restaurant is heavily concentrated on seafood. Just like Le Farm, The Whelk shares the same artisanal philosophy, using as many fresh and locally grown ingredients as possible. The Whelk is also focused on fresh and sustainable seafood. Question: So, you are asking, what is a whelk? The answer is below. We started off with appetizers and small plates. 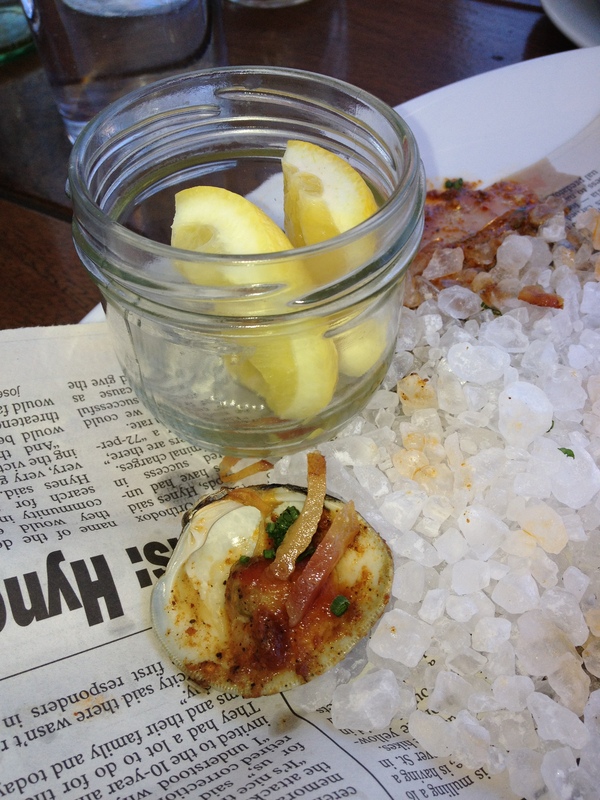 As in a typical seafood shack, our first courses were served on plates covered in newspaper. Here is one BBQ little neck clam left from a plate of eight. These were fresh clams with a little bit of BBQ sauce and bacon placed on top before being placed under the broiler for a few minutes. These clams went fast. 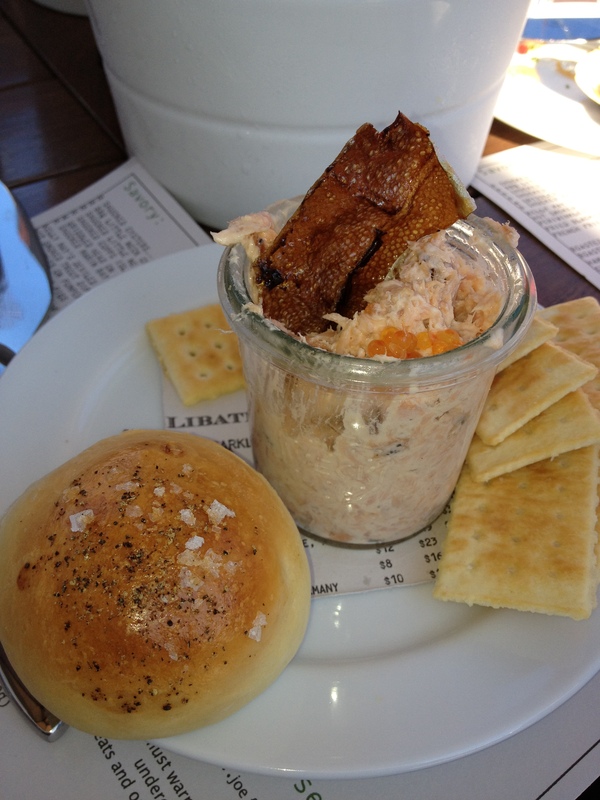 Another favorite was the hot smoked trout dip served with trout roe and crackers and bread. We have a friend who says she has never met a potato that she doesn’t like. 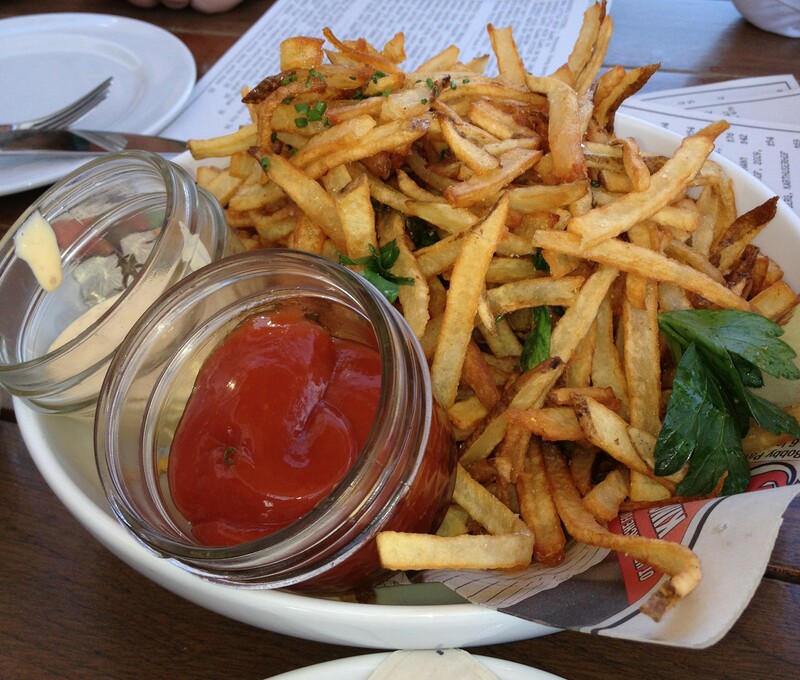 Here are some french fries with ketchup and a delicious smoked mayo. 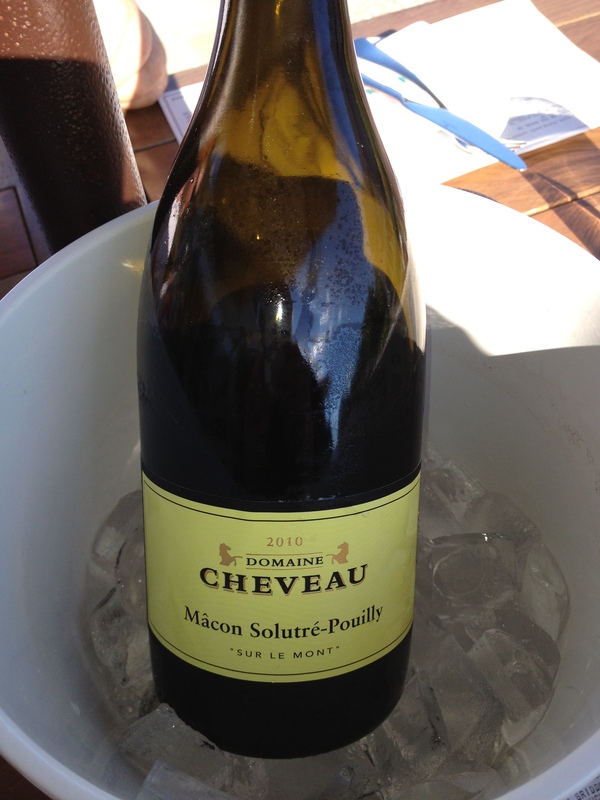 A good wine that was recommended to us by our server. The Whelk has a large list of by-the-glass and by-the-bottle wines. This French selection was a little more acidic than I would normally like, but that worked well with the seafood that we ate during our visit. One of my favorites! 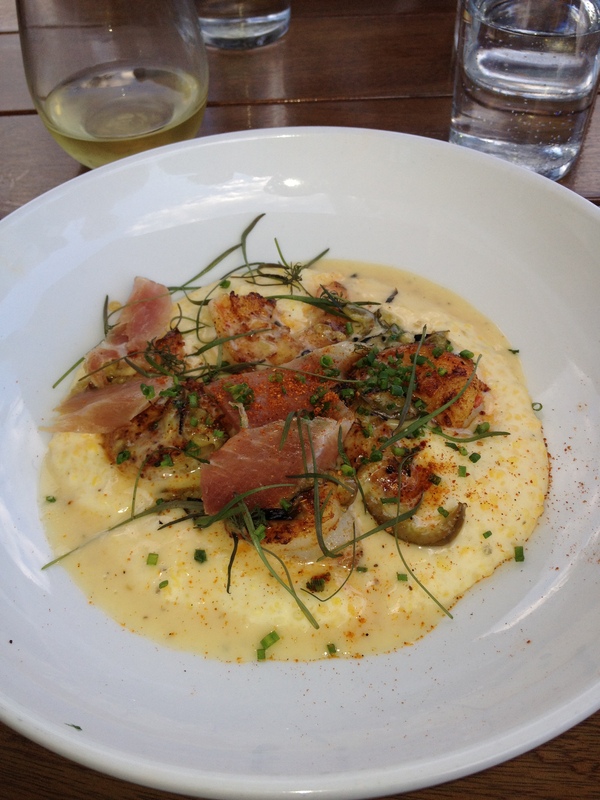 Gulf shrimp and grits with pickled jalapeno-ramp butter and country ham. Reminds me of our trip to Charleston, SC. One of the more unique offerings the night we were there. 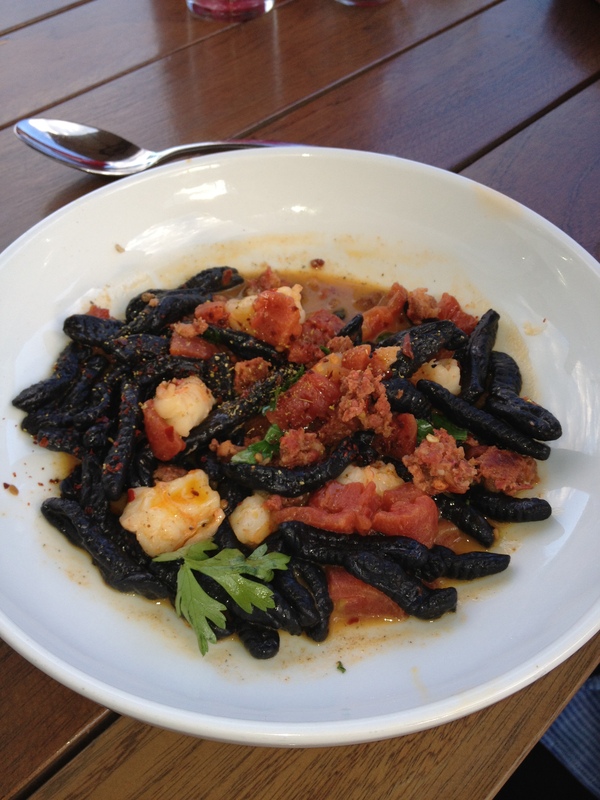 This is squid ink cavatelli with red shrimp, mexican chorizo and preserved tomatoes. 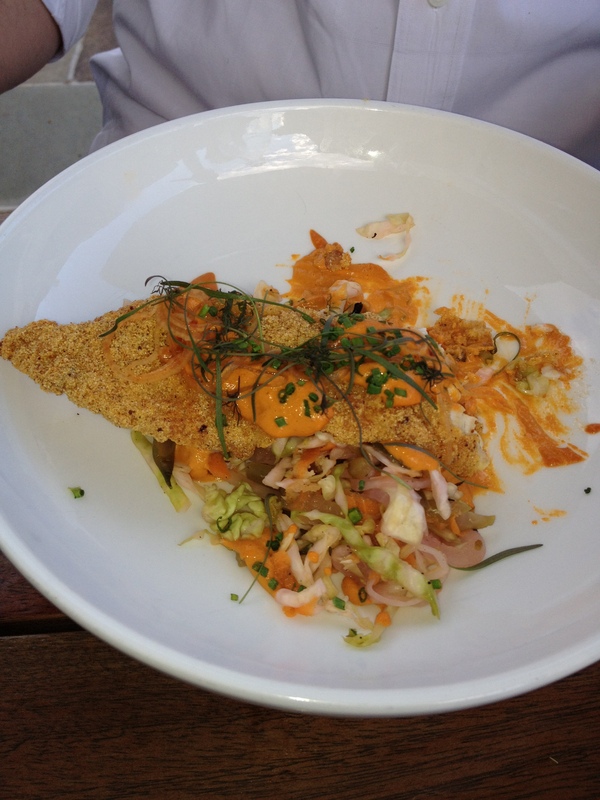 Cornmeal fried catfish with early summer slaw and walnut-pepper romesco (partly devoured at time of photo). 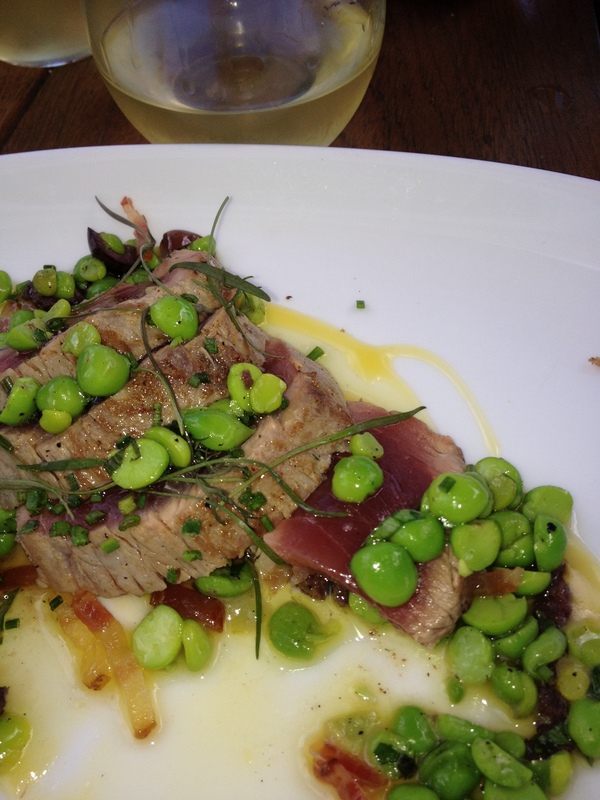 Rare seared line caught tuna with bacon and black olive and green pea dressing. An offering that was limited, but we were lucky enough to “snag” one. Get the seafood joke here?!? My vote for “Best Of Show”. 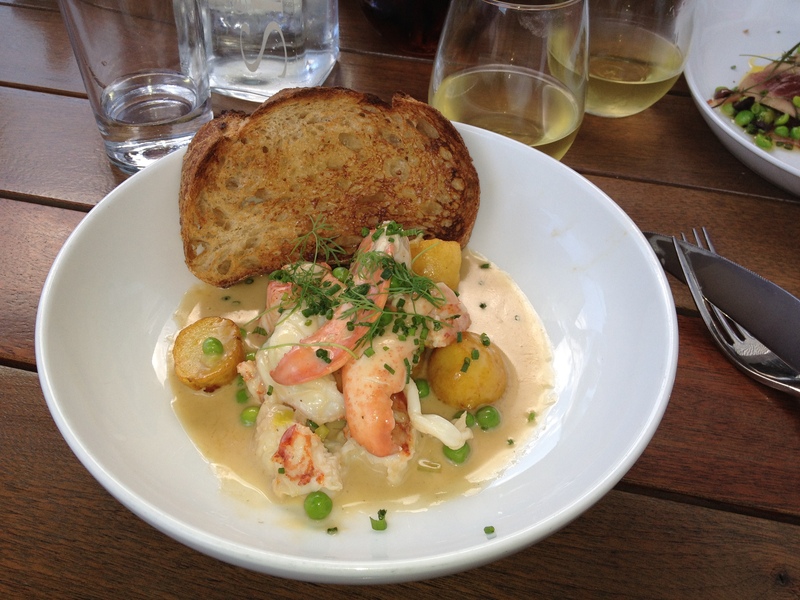 Norman’s (we don’t know who Norman is, but he is a man with good taste) lobster butter with leeks, peas and fingerling potatoes. We were told this is a lobster that is slowly poached and then removed from its shell. The poaching liquid is then reduced and the lobster meat is added back along with the potatoes, peas and leeks. What’s dinner without some dessert? 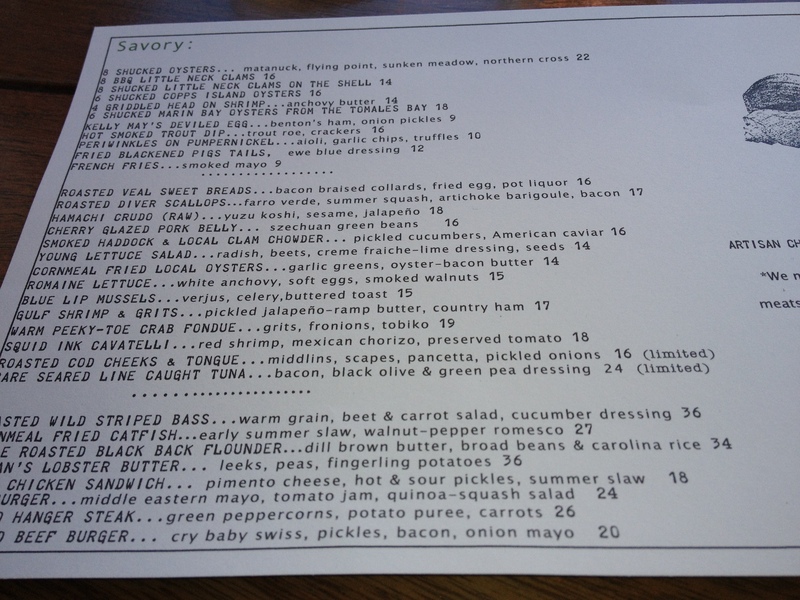 The Whelk offered a small and homey dessert menu for us to choose from. 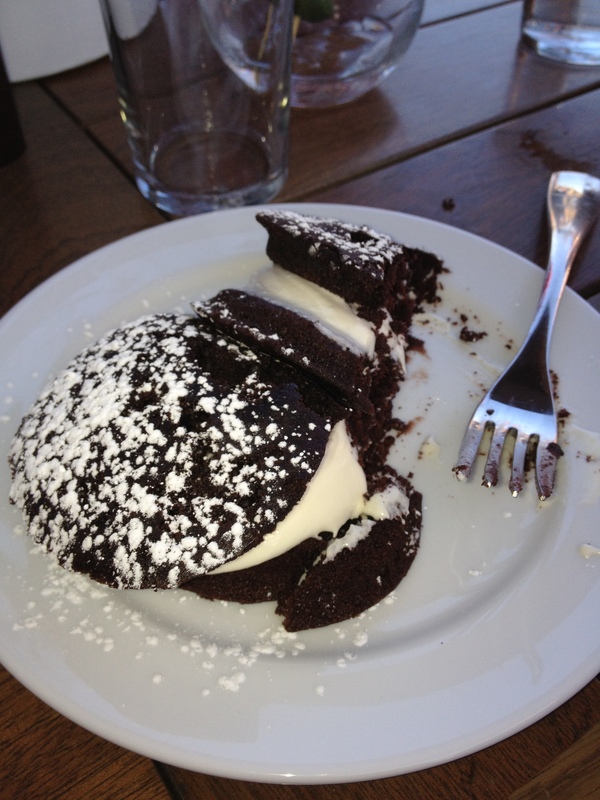 A quickly devoured set of Whoopie Pies. These pies never disappoint. Two at a time…a magic bar in the background with butterscotch and sea salt. 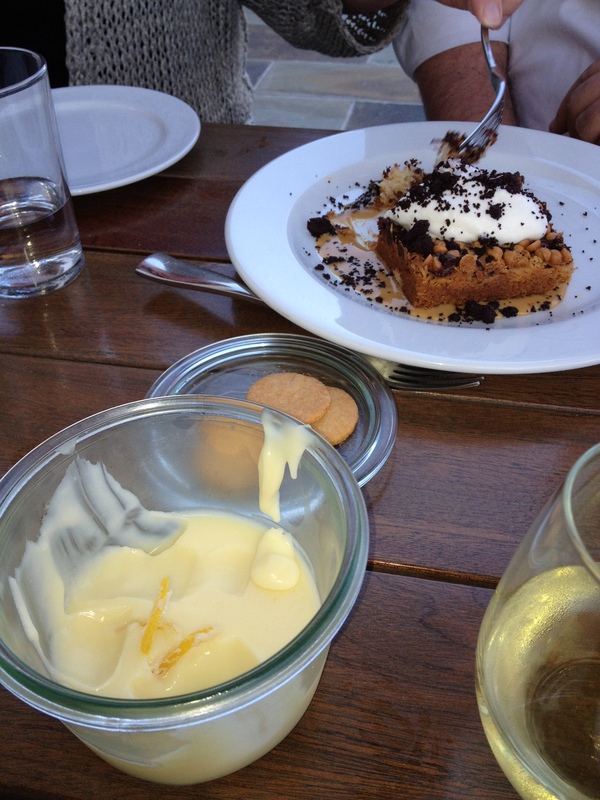 In the front is a meyer lemon posset with cornmeal cookies. Yummy! As in our visit to Le Farm, we all left full and happy. Like I said, we’ll be back on Tuesday so that shows how good The Whelk is. 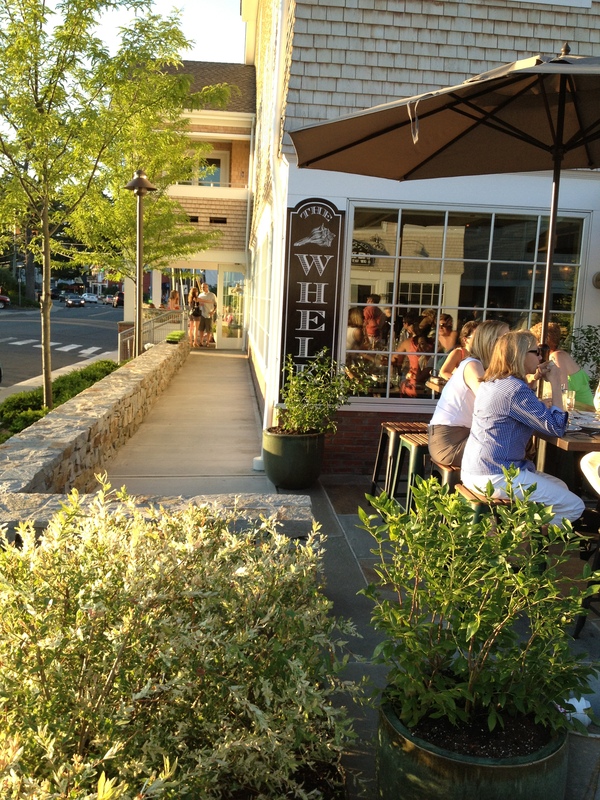 If you are around Westport, you need to give The Whelk a try. If you are like us, one trip just won’t be enough. Answer: So what is a whelk? A predatory marine mollusk (family Buccinidae) with a heavy, pointed spiral shell, some kinds of which are edible. As Bill Taibe has said, calling his restaurant Le Mer would have been too easy. There are many ways to bring in the New Year. So whether you want to bring it in all sweet and sentimental or you bring it in rowdy and crazy, the choice is for you to make. Whatever way you choose, please know that all of us here at Acorns On Glen want to wish you, your family and your friends a very Happy New Year 2012 and may even your wildest and craziest dreams come true. We look forward to spending more time with you in 2012. Our best to you in the New Year…………and where is the Advil for our friend below? This is the heart of Broadway and what it looks like outside a theater when a show finishes. There are cars there to pick up the stars and fans lined up and down the sidewalk to get a look at or talk a little bit to the stars. 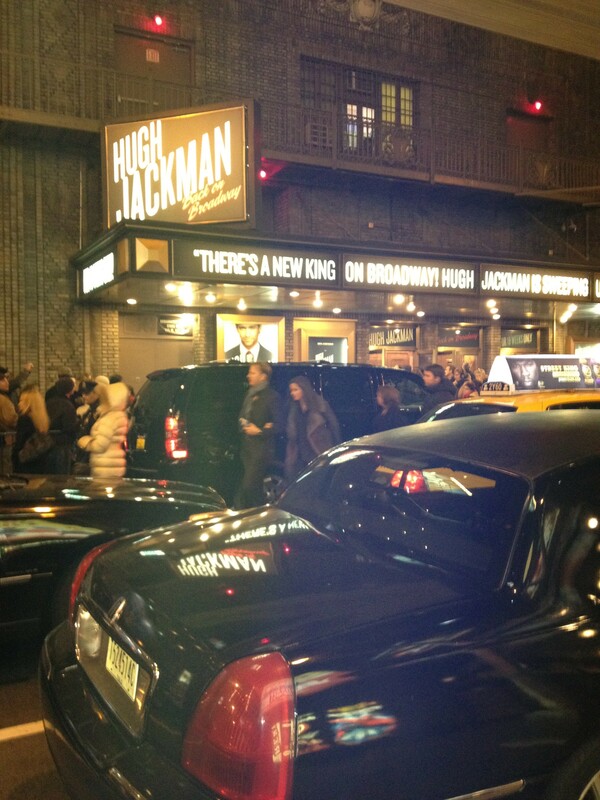 Hugh Jackman gets quite a crowd who wait for him each night. He should–his show is great. See the people who are waiting on the left? Usually after a show lets out, my group always runs out of the theater and starts looking for a cab. It’s hard to get a cab when everyone else who has been to a show is trying along with you. We usually have dinner plans too so we need to get to the restaurant pronto. It was different this night. There was no need to rush. Why rush? This was different. Why the change from hurried to mellow? 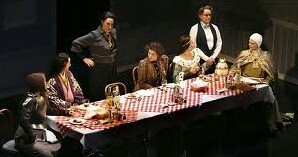 What had changed inside of me on this night of theater? 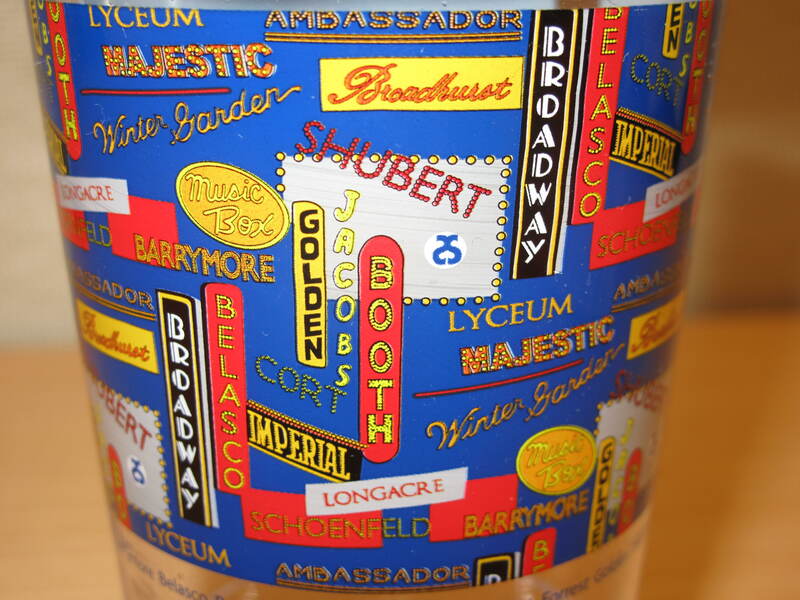 Blame it on the evil theater cup! I saw my first show on Broadway in 1986. It was “Song & Dance” with Bernadette Peters. I have been going to see shows on Broadway ever since. One thing in all these years has remained constant. You are not allowed to bring any food or beverage to your seat. That is the law of theater! You can eat and drink before a show or at intermission, but do not bring it back to your seat. If you even tried to break the rule, you would be hit with a flashlight beam and there would be an usher telling you to hand it over. No eating! No drinking! These ushers would have the meanest face when you looked up at them from your seat with your bottle of water or your last Milk Dud in hand. These ushers would make prison guards nervous. Now all of this has changed. You have an ugly cry for all to see during the last song of the show. You give a standing ovation to the star while all the while hooting and hollering and making a spectacle of yourself. You stumble out of the theater telling people you don’t know that you just spent $37 on wine. You proceed to tell your friends that next time you are going to save money and just buy a bottle of wine at the liquor store and have the bartender hold it for you because you can fill your own cup. You don’t run like hell to catch a taxi. The restaurant can wait! 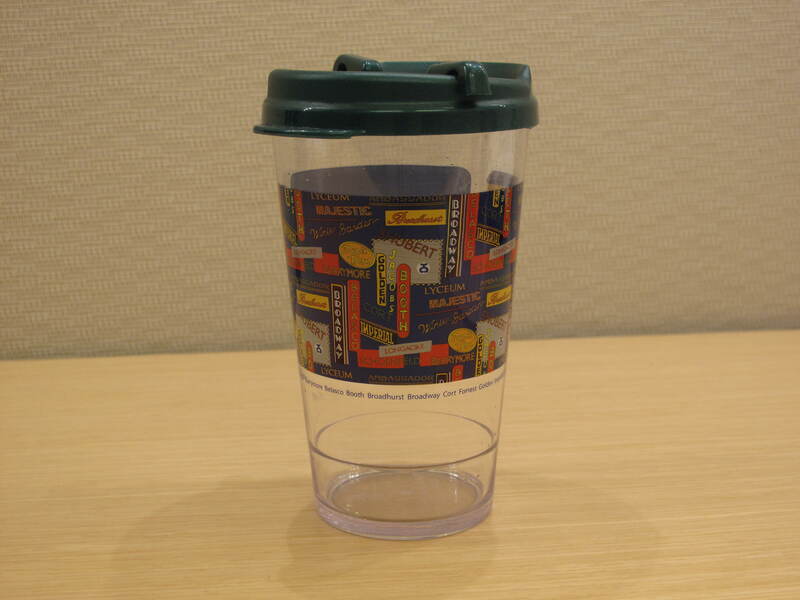 You realize that the evil little theater cup is a blessing and a curse. Now I know that the invention of the evil little theater cup was probably done to boost sales during the slump in the economy. However, I think it is also a great idea to use for shows that are not very good. 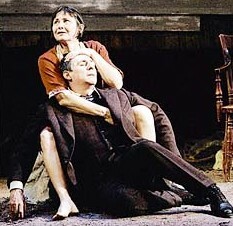 If I could have had my two cups full of Chardonnay in years past, I might have stuck around for the end of “A Moon For The Misbegotten”. I wouldn’t have fallen asleep during “Top Girls”. 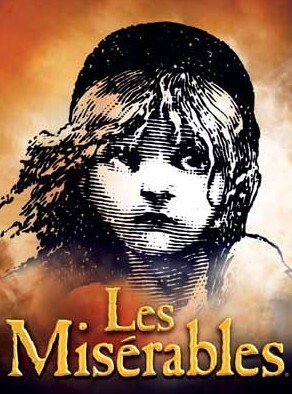 Lastly…..yes, I’ll publicly admit this……I wouldn’t have wished I could get a musket and shoot all of those revolutionaries on stage in “Les Miserables” just to make it end. So, I don’t like change very much, but I think that the evil little theater cup is a keeper. It makes a great show even better and I hope to also use it someday to see if it can make a bad show at least a little more bearable. Oh, as with everything, moderation is key when using the evil little theater cup. Who am I kidding? I would sit there and drink wine out of a bottle with a straw if they’d let me. Enjoy your next show, with or without a little booze. What do you think of being able to eat and drink at your seats? This little drink can really make roasting chestnuts on an open fire or going over the river and through the woods a lot less painful. It is a juice and vodka drink that we call a Pomatini. 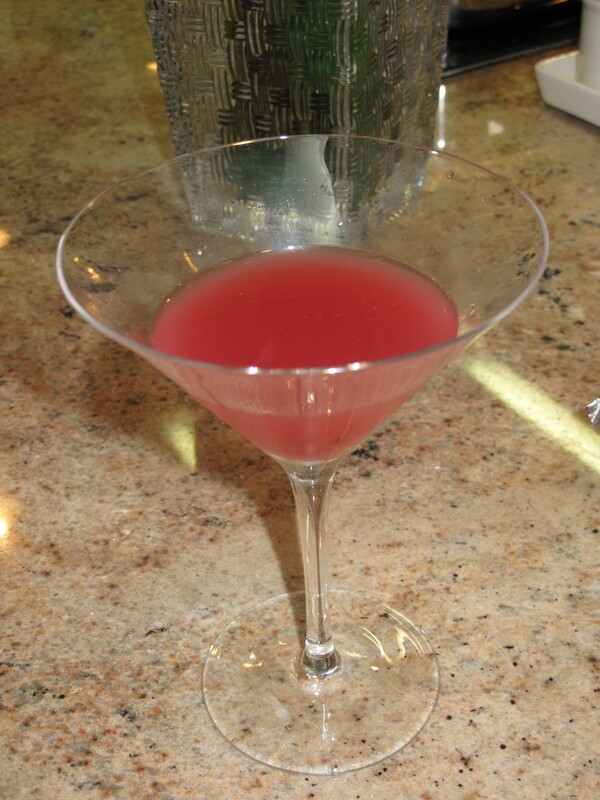 It is made with fresh squeezed pomegranate, grapefruit and lime juices. We made the drink on Thanksgiving morning and actually sat our Pomatini filled decorative pitchers outside so that the drink could cool down before serving. During our appetizers before the big Thanksgiving meal, we poured, shaked and drank Pomatinis. Wow, it sure worked to make good food taste even better. We decided to make these drinks because pomegranates seemed so Thanksgiving-like. If you think of it, you could really justify this drink for any holiday or occasion–the reddish color fits in well with Christmas festivities or the juice make-up is perfect for a July 4th party. So the next time you have a get together, consider the Pomatini! 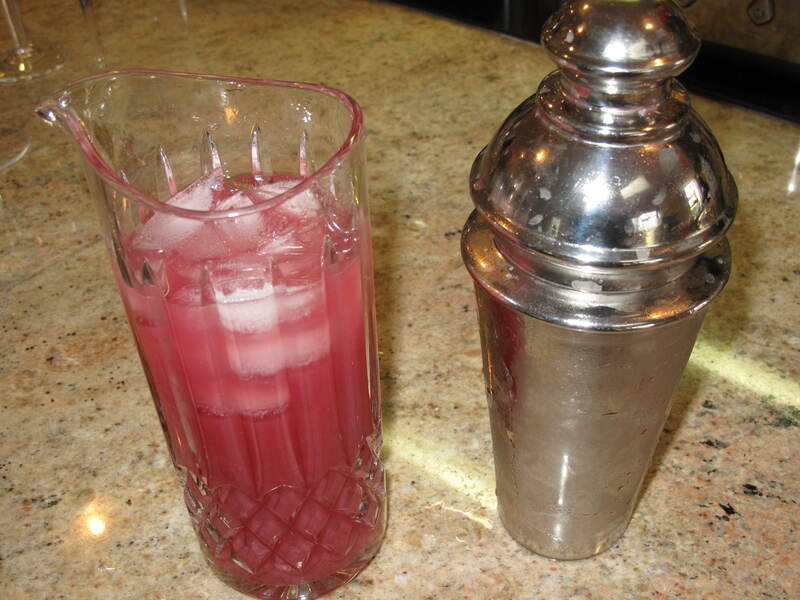 Combine pomegranate juice, vodka, grapefruit juice, lime juice and simple syrup and then pour into decorative pitchers. Continue recipe, making it in the proportions provided, until all of your pitchers are filled. Add ice to chill into the pitcher or pour drink into a shaker filled with ice. Strain drink into a chilled martini glass. Bring sugar and water to a boil in a small saucepan over high heat. Cook, stirring, until sugar dissolves. Let cool. So why not use our Pomatini to help reduce your stress level during your next holiday get together or party? Be warned, if you drink more than a couple of these Pomatinis make sure you use a designated driver when you go outside to drive your sleigh around. What great cocktail recipes do you make during the holidays? 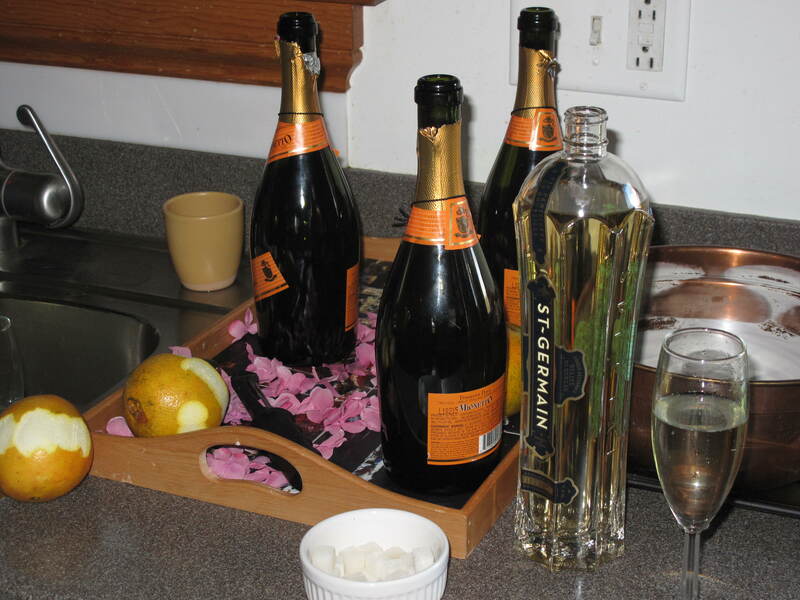 Take a champagne flute and fill it about 3/4 full with your favorite chilled champagne. Then add about half of a shot of the elderflower liqueur into the flute. Next, drop in one sugar cube that is generously soaked in the orange bitters. Garnish by dropping in a slice of fresh orange peel. Enjoy!! I’ve seen more and more drinks that are being made these days with the elderflower liqueur. I’ve read that it is an artisanal French liqueur made from hand-picked elderflower blossoms. The starry white flowers are gathered by 40-50 folks pedaling the Alpen French countryside picking the flowers that is then distilled into this liqueur. It is blended with a small amount of citrus and natural cane sugar to accentuate the subtle flavor of the elderflowers. The resulting liqueur is delicate and balanced with fresh floral aromas and flavors and hints of pear, apricot and grapefruit zest. So if you are looking for a sweet little brew, go ahead and give this one a try….and let me know what this is called if you know its name. Have you ever used elderflower liqueur in any of your drink specialties? This is the easiest appetizer in the world to make. For as easy and low-key as it was to make, it was the hit of the night. 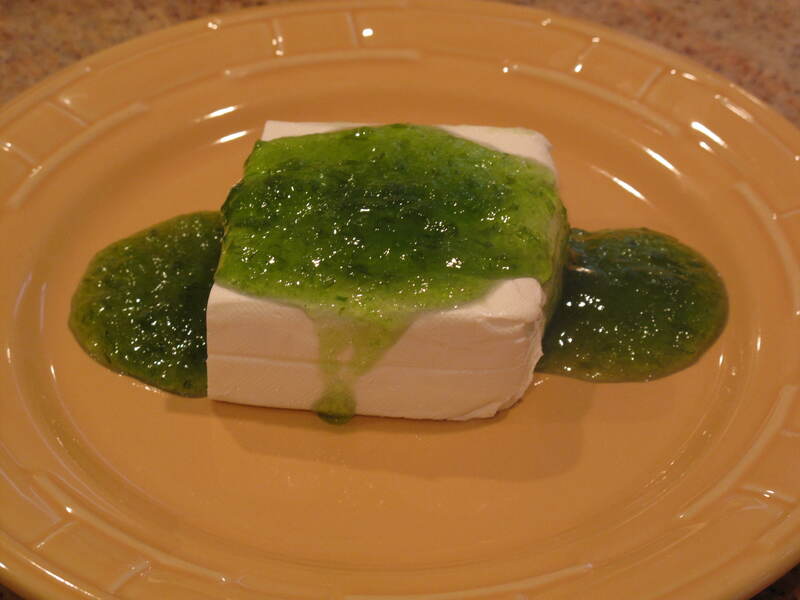 It is some hot pepper jelly spooned over cream cheese. 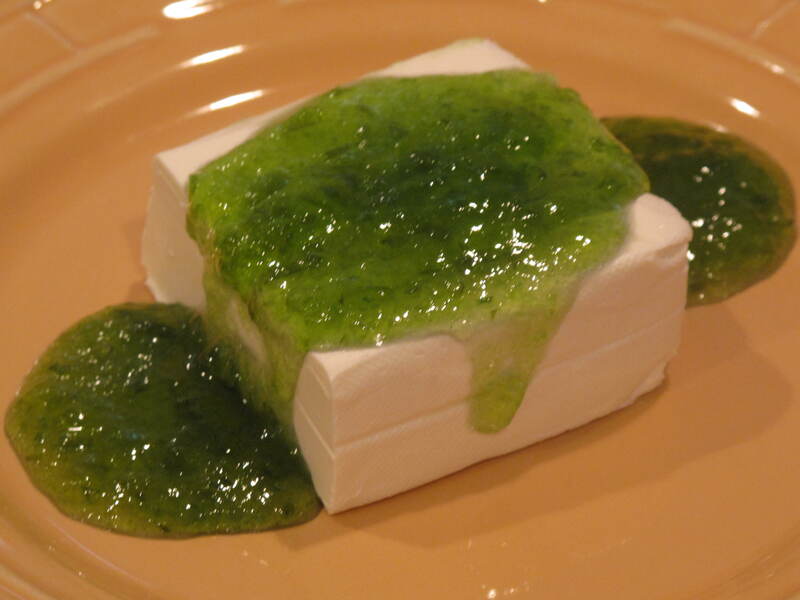 When everyone took a cracker and dipped it into the jelly and cream cheese, there was not a person at our house that didn’t declare that this was delicious. Why is this always the case? The food you spend hours preparing is o.k., but the simplest fare, like our hot pepper jelly, is the rage of the evening. To add insult to injury, I didn’t even make the jelly. No, it was in a jar and comes from a company named Mrs. Sassard’s in South Carolina, a family run business that has been selling its home-made Southern specialties since 1917. Now operated out of the family home, the company hopes to expand into larger space and add new equipment, products and a Web site over the next few years. 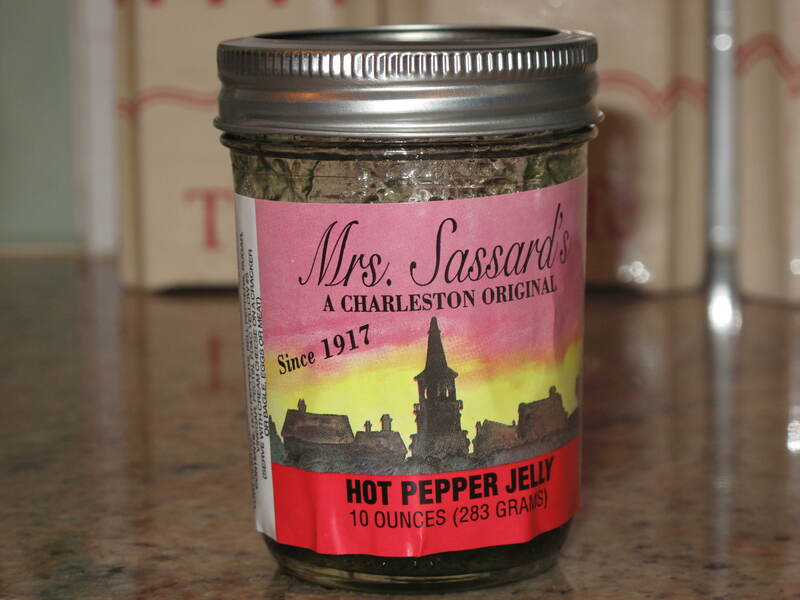 In addition to the jelly, Mrs. Sassard’s also makes and sells a number of other relishes and preserves, like artichoke relish and pumpkin chip preserves. For the purists out there, I also have a recipe if you would prefer some homemade hot pepper jelly. Process bell pepper and hot pepper in a food processor until finely minced. Combine pepper mixture, vinegar and sugar in a saucepan and bring to a rolling boil. Remove from heat and add pectin and food coloring. Pour into sterilized jars and seal according to USDA guidelines for sterilizing jars/lids and canning. I know this doesn’t look like it would taste so good, but as they say, looks can really deceive. Whether you track down a bottle of this jelly like I did or make your own, give this hot pepper jelly a chance at your next get together. The peppery taste with a hint of heat mixed with the creamy texture of the cream cheese on a cracker can’t be beat. Again, it is also so easy! Have you ever eaten hot pepper jelly?